There are many patients that continue throughout life with missing teeth but they’re unaware of the true health risks that are associated with missing one or several teeth. One risk is the movement of your natural teeth from having spaces in your smile. Your surrounding teeth shift to fill the space left by missing teeth. This movement can be painful, but it can also create gaps between other teeth and lead to crowding or overlapping. Losing both the visual part of your teeth and the vital tooth root not only affects you cosmetically, but it will deteriorate your oral health. Your jawbone density and gum tissue are shaped by the roots of your teeth. Stimulation from the roots keeps the jawbone healthy and gum tissue full. When there is an empty space, the gum tissue recedes, and you are more likely to experience jawbone deterioration. A crown is a prosthetic tooth that can be bonded to tooth fragments from broken or decayed teeth to help retain the root and any natural tooth that remains. Our dental crowns are custom made for you and will help retain the shape of your mouth. Crowns make it possible to restore your smile without extracting the remaining tooth. Our practice always strives to preserve natural teeth whenever possible, and crowns allow us to keep teeth that would otherwise be lost. But, if you do have a missing tooth already, we can retain the crown with a dental implant. A dental bridge or fixed bridge works much the way it sounds. 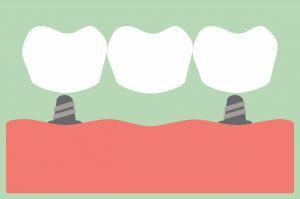 The way that a bridge connects one road to another, a dental bridge connects a replacement tooth to the two teeth on either side. There are many different types of bridges, and the type that will work best for you will be determined during your consultation with our dental experts. Most bridges work by placing crowns on the teeth on either side of the gap and connecting these crowns to replacement teeth. You shouldn’t ever delay seeking care when you really need it—after all, the issue will only get worse. If you need to replace teeth or are facing tooth loss, contact our office to schedule a consultation. We would be happy to discuss our various restorative options with you!